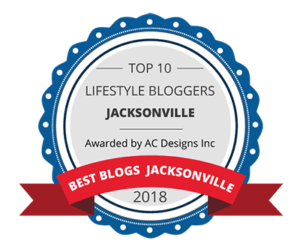 Hi Dolls, Whit’s For Dessert is definitely something you might hear a lot of during the summer months, here in Jax! The frozen custard creamery has made its way from Ohio to Jacksonville with one of its most recent to open in the Avondale community. 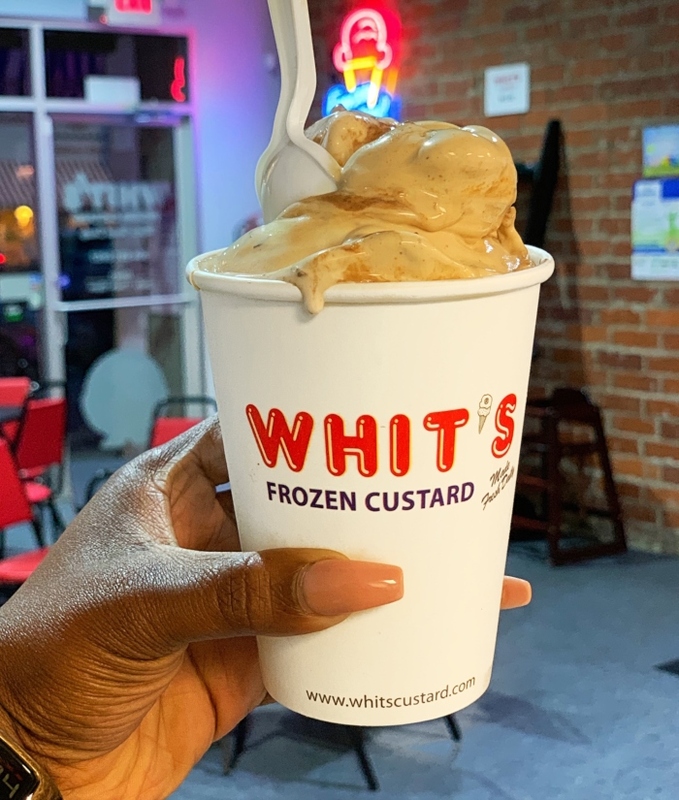 Frozen custard would be a sweet treat any time of the year and I recently had the opportunity to try some, for the first time, when I visited Whit’s Frozen Custard earlier this week. Don‘t Call It Ice Cream! So, I know the burning question is “How is frozen custard different from ice cream?” and the answer is pretty simple. Both frozen custard and ice cream contain milk, sugar, and cream but frozen custard has an extra special ingredient, egg yolk! This makes frozen custard thicker, smoother, and creamier than ice cream. 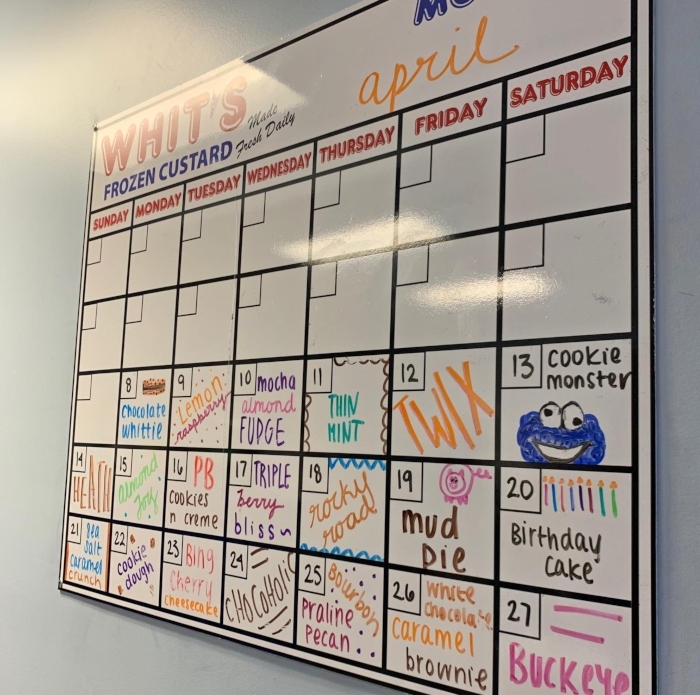 Every month, Whit’s releases a flavor calendar with the flavor of the day. While you can still order from the regular menu, you have the option to try a different flavored frozen custard every day. 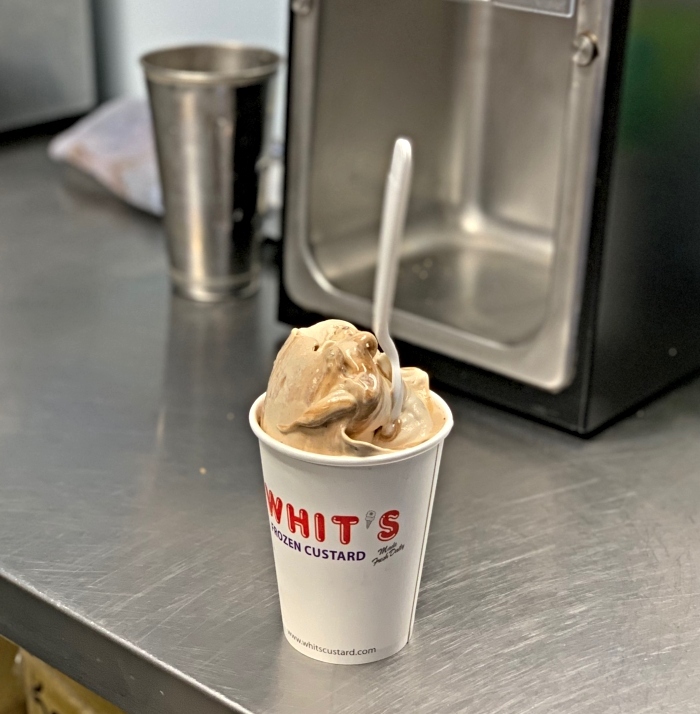 Whit’s also has a “NO-WASTE” policy so anything unsold from the daily flavor is packaged into pints or quarts and stored in their retail freezer for purchase. I already know that I’ll be heading in on the 25th for a pint of the Bourbon Praline Pecan! It sounds delightful! 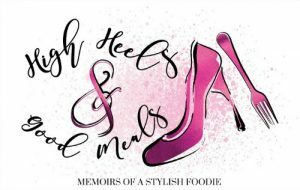 On this particular visit, I had the distinct pleasure of sampling several a variety of items from their menu! The first was a good ole’ classic banana split! It definitely took me back to my childhood as I can’t remember having a banana split as an adult. I ate my fair share of them as a kid. 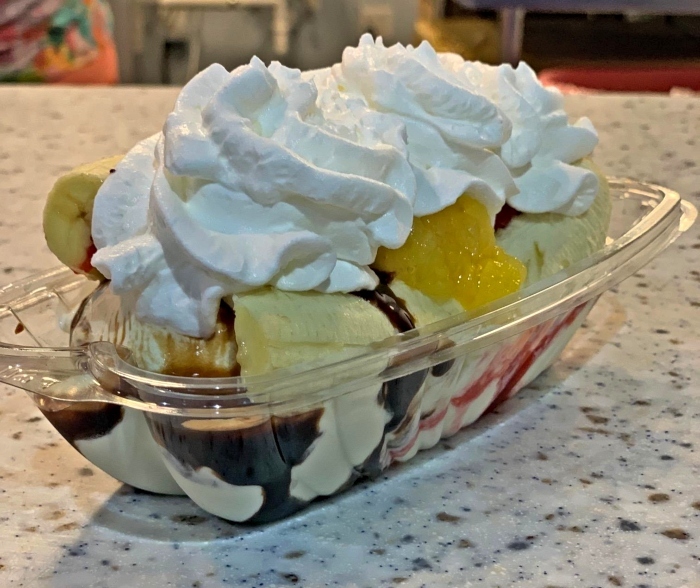 In true banana split fashion, it came with a whole banana…split, chocolate syrup, strawberries, pineapples, whipped cream, and a cherry on top! It was delicious and nostalgic for sure! 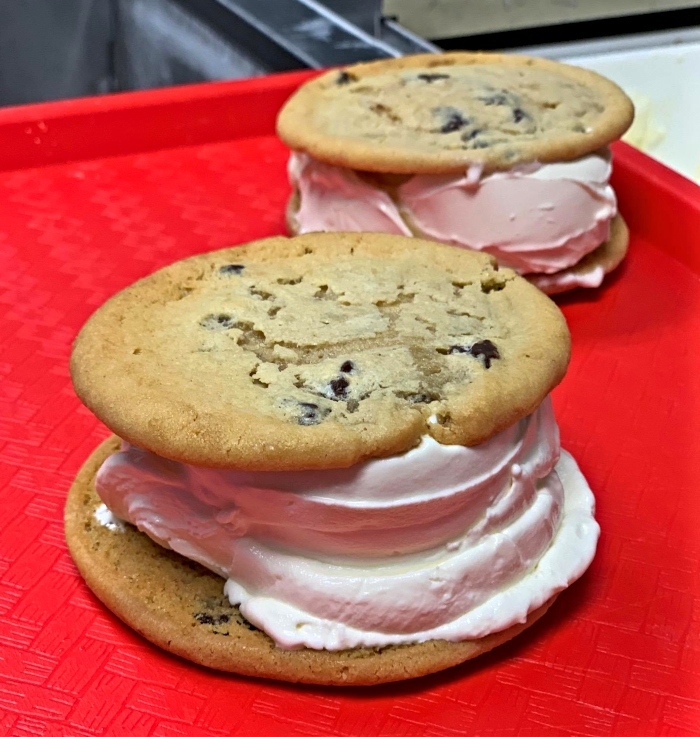 Whit’s Frozen Custard bakes their chocolate chip cookies in house, daily for their “Whittie” frozen custard sandwiches! These were so good! The frozen custard was thick but oh so creamy and with two freshly baked chocolate chip cookies on either side, it felt like the ultimate dessert! Blizzards eat your heart out! The Whitser is the frozen custard, creamier version! Made in a similar fashion, you add the all the flavors you like and it is whipped together and served with a spoon sticking straight up! This was the Beach Madness made with Reece’s Cup bites, chocolate syrup, and peanut butter. It was a peanut butter lovers dream! Whit’s has special cups and cones for kids including “Dirty Worm, Fish Bait, and this one pictured, Happy Sunday. 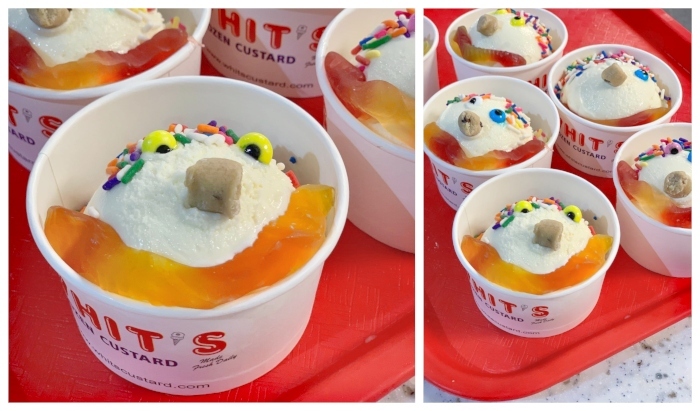 It included the vanilla custard with eyes, a nose, a smile, and sprinkles! Such a cute dessert for the little ones! And you can’t forget the furry friends! 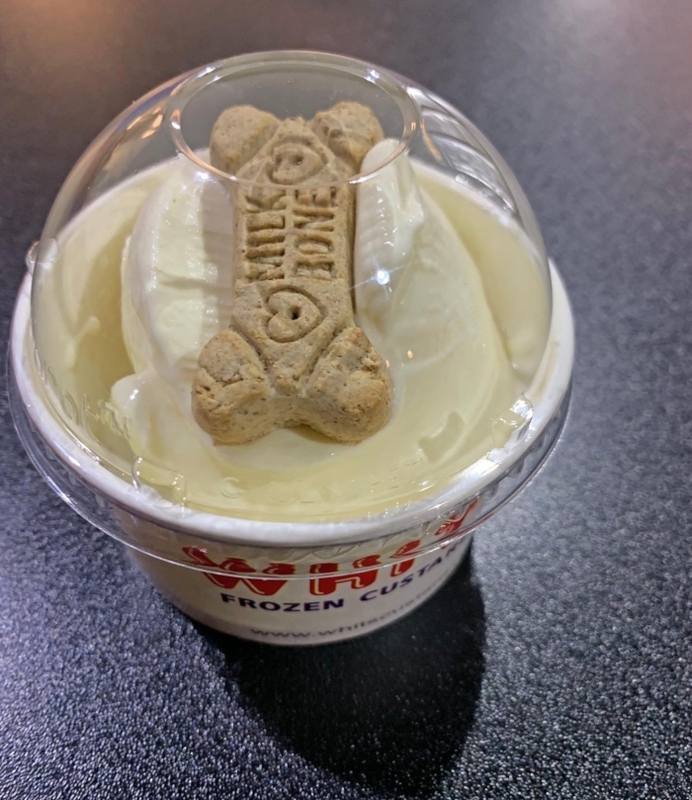 Whit’s even has doggie sundaes with vanilla custard and a doggie biscuit on top! Whit’s for Dessert, for everyone in the family! I really enjoyed everything I sampled! Frozen custard is indeed thicker, smoother, and creamier than ice cream. I think Whit’s Frozen Custard is a perfect new addition to the Avondale neighborhood. You can find them all over town though! It’s a good thing that my body limits the amount of dairy I consume or else I’d have Whit’s For Dessert everyday! Next time you’re in need of an after dinner treat, you should make a trip to Whit’s! Bring the whole family! As always, thanks so much for stopping by!